At VitalBodies we had UPGRADED all of our computers from Windows to Ubuntu some time back. And we have no intention of going back to Windows. This week we updated Hardy Heron to Intrepid Ibex. Very nice simple process. Much thanks to the Ubuntu Team! Essentially you just tell Ubuntu you want to be offered Normal Releases rather than just the Long Term Support Updates Only. System > Administration > Software Sources > Updates > Release Upgrade > Normal Releases. System > Administration >Update Manager. From here you will see if an Update is available. For us updating required a reboot. Also once the installation part starts (after the download) you will not want to have any applications running. We had Firefox going and it simply shut it down. Firefox saved all our tabs though. We noticed that our Preferences Appearance had been changed once the new upgrade had started after a reboot. Preferences > Appearance > Visual Effects had been set to Normal rather than None. Preferences > Appearance > Visual Effects. Evolution the mail program in Ubuntu also has had a few anomalies but those usualy get worked out in a day or so after a big update. For us when writing a reply to an email every word is underlined in red as if every word is mis-spelled. 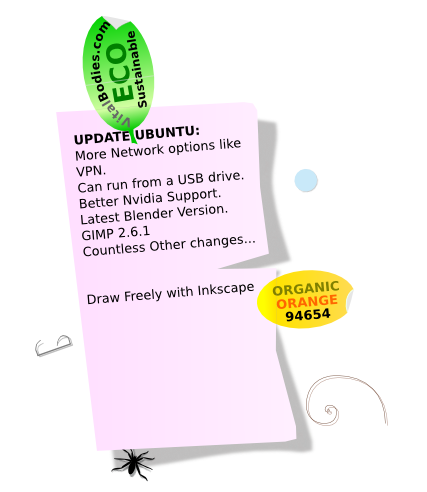 This version of Ubuntu is also fully able to run from a USB drive. This means you can take your favorite Operating system all of the programs, files settings and everything with you! Having a Portable Operating System is definitely the way to go! GIMP 2.6 is standard with Ibex! Yes! Bugfixes, Updated translations. “One Window Gimp” option added. PlusGEGL. The little Icon that shows if we are connected to the router has had features added like VPN. On the Lenovo ThinkStation Nvidia graphics driver (proprietary) is now fully operational and there is a control panel for that. System > Administration > Nvidia X Server Setting. Very nice, you can even monitor the temperature of the chip. The latest Blender version is also in Ibex! The Quit button is now integrated with logging in and out. To update to this change also required a reboot. In trying to print to an Epson CX7400 color inkjet using USB we get an errors saying “Specified ColorSpace is not supported”. The ColorSpace is set to CMYK which is correct. Tried a few other ColorSpaces and got the same error. Tried printing from two different computers and had the same odd results. We have tried printing the driver TEST PAGE, a PDF, from OpenOffice and from Inkscape. This problem happened after updating to Ibex. The printer worked before that on both computers. 2 days later, updates fixed the problem – nice! Since this is a fairly minor update I would guess that the vast majority of the articles on this blog that were written for Hardy will work for Ibex.